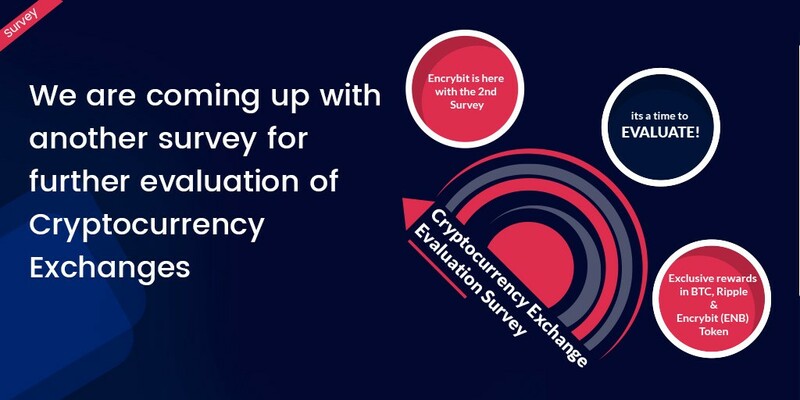 Encrybit - The next generation Cryptocurrency Exchange is coming up with another survey - "Cryptocurrency Exchange Evaluation Survey"
With the overwhelming response received in the first survey (Cryptocurrency Exchange Problems Survey), the Encrybit team has geared up to conduct another survey for extended evaluation of current cryptocurrency exchanges. It is going to be a multiple choice questionnaire including advanced trading features, personal trading preferences and demographic details. The purpose of this survey is to move nearer to our goal for developing an exchange which fulfills traders' demand. An improved version of every exchange component. To boost the enthusiasm among participants, rewards have been planned as well like in the previous survey. This time it's bigger and better with 1300 winners and highest reward being BTC worth $500!!! You can't miss the opportunity to participate in such an incredible survey! Give your honest opinions and be a part of the revolutionary change. Earn rewards in return. The day has arrived and the survey is now LIVE!!! Participate and mark your contribution to the extensive evaluation of existing cryptocurrency exchanges and of course express your trading preferences. And who knows you can be one of the 1300 lucky winners! Hurry up and grab the opportunity! Have you not participated in the survey yet? Are you not able to take some time out from your busy schedule? Don't worry, we received similar requests from traders and have decided to extend the survey till July 31st. Now, you can fill out the survey in your free time at the weekend! Participate and let your thoughts speak! Win exciting rewards for your valuable opinions!!! The survey is now closed. We are happy to receive response from 10,003 participants. Thank you everyone, for making it a huge success. The results will be announced within 15 days. Stay tuned with us on Twitter on Telegram to know the detailed insights and winning participants.